The increasing possibilities that come from deploying mobile solutions in the workplace are now counter balanced by an exponentially complex ecosystem of options that can make navigating the corporate mobile landscape challenging - and risky. While organizations are rightly deploying mobile device management solutions as means to secure their mobile devices, there is much more to be done. 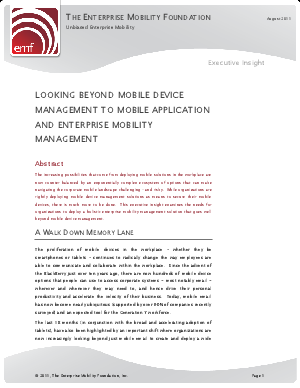 This executive insight examines the needs for organizations to deploy a holistic enterprise mobility management solution that goes well beyond mobile device management.